A Taliban spokesman in Pakistan denied on Saturday a CBS News report that al Qaeda No. 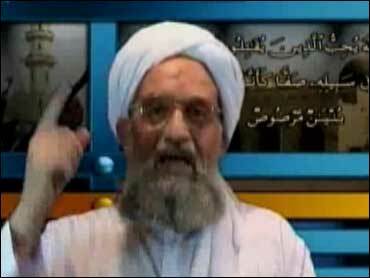 2 Ayman al-Zawahiri may have been killed or critically injured in a missile strike. CBS News chief foreign affairs correspondent Lara Logan exclusively reported Friday that CBS News had obtained a copy of an intercepted letter dated July 29 from unnamed sources in Pakistan, which urgently requested a doctor to treat Osama bin Laden's top lieutenant. The letter was purportedly from Taliban leader Baitullah Mehsud and said al-Zawahiri is in "severe pain" and his "injuries are infected." It was dated July 29 - one day after a U.S. air strike that killed al Qaeda weapons expert Abu Khabab al-Masri and five other Arabs in South Waziristan, reported Logan. Mehsud's signature and seal were visible on the letter along with the Taliban logo. Experts confirmed to CBS News that the logo and Mehsud's seal were legitimate. "We deny it categorically," Mehsud spokesman Maulvi Umar told The Associated Press by telephone from an undisclosed location inside Pakistan. Pakistan army and intelligence officials said they had no information that al-Zawahri was hit in the Monday missile strike. Both bin Laden and al-Zawahiri are believed to be hiding in the rugged and lawless tribal regions along the Afghan-Pakistan border. There is increasing pressure from the West on the four-month-old Pakistan government to act against Taliban and al Qaeda strongholds in the frontier region with Afghanistan amid concern that peace deals have given militants more freedom to operate. The U.S. military did not confirm it was behind the missile strike. But similar strikes are periodically launched on militant targets in the tribal border region and previous such attacks inside Pakistan are believed to have been conducted by the CIA using Predator drones. A missile strike by a CIA Predator drone in Bajur tribal region, north of Waziristan, in January 2006 apparently targeted but missed al-Zawahri. The missile strike on Monday hit a compound that used to be a religious school near Azam Warsak village, about two miles from the Afghan border. Umar claimed only religious students died in the attack. "Whenever America targets and kills innocent people, it comes up with such propaganda, that it has killed a big personality, in an attempt to justify the cruelty it has done," he said. Two Pakistani intelligence officials and at least one pro-Taliban militant said they believed al-Masri had died in Monday's strike and an American official in Washington expressed cautious optimism. The U.S. is offering a $5 million reward for information leading to his capture. A counter-intelligence expert and other U.S. officials confirmed to CBS News that the U.S. is also looking into reports that al-Zawahiri is dead. Mehsud is the leader of a coalition of Taliban groups in Pakistan and he was accused by the CIA of plotting the December assassination of former Prime Minister Benazir Bhutto.